St. Paul writes that marriage is a sign of the marital love existing between Christ and His Church. The married couple is seen as a symbol of the unconditional love and intimate union between Jesus as the groom and the Church as His bride. Marriage fills us with joy and gratitude. That is why we take the preparation and celebration of your wedding ceremony so seriously. Through the years, the many beautiful weddings at Our Lady of Lourdes have built a tradition of family and parish life that is very important to us. These guidelines are important, whether your ceremony is simple or elaborate. Every wedding is significant. We want to help make your wedding the most important event in your life. To assist us in this task, we ask you to read these guidelines thoroughly. Parishioners of Our Lady of Lourdes Parish and their children are welcome to be married at Lourdes. A parishioner is someone who has been registered in the parish for six months, actively participating in the Sacramental life of the parish and supporting the mission of Our Lady of Lourdes. A six-month period of preparation before the wedding is required. Please contact Msgr. Hanneke before making any plans to be married at Our Lady of Lourdes. 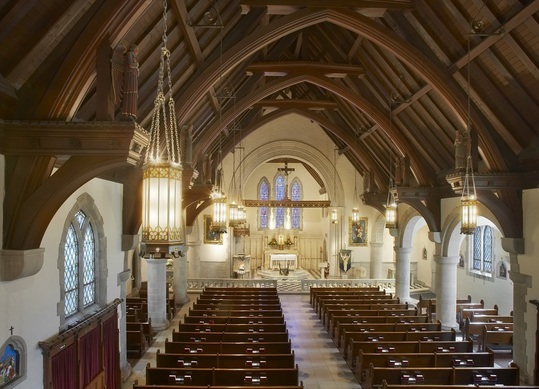 Our Lady of Lourdes Parish church is available for non-parishioner weddings. We ask that you invite a priest or deacon of your choosing to prepare you and to officiate your wedding. If the priest or deacon is from a diocese other than the Archdiocese of Saint Louis, he must provide a letter of suitability from his local Ordinary. Your priest or deacon will complete all of the necessary paperwork and will assist you with planning your wedding ceremony in conjunction with the guidelines of the Catholic Church and the Archdiocese of St. Louis. All proper forms and dispensation(s) shall be delivered to Our Lady of Lourdes Parish Office no later than 30 days prior to the wedding. Non-parishioner weddings can be scheduled no sooner than one year in advance, and there will be no more than one non-parishioner wedding scheduled on any Saturday. Cost: $1,000 (please note: $500 deposit is necessary to hold the date). If you are awaiting the decision of the Marriage Tribunal regarding a possible annulment, please wait until you have received the final papers before calling to schedule a wedding. * Assessing readiness for marriage. This involves the completion of the FOCCUS test and completion of the Pre-Nuptial Investigation Form. * Participating in one of the several marriage preparation programs available in the Archdiocese, such as Pre-Cana or Engaged Encounter. * Obtaining a recently issued baptismal certificate from the church where you were baptized. * If you wish to have a priest or deacon of the parish officiate at your wedding ceremony, please contact him before setting a date or making other arrangements. * witness your marriage ceremony. Music: Only approved liturgical music is permitted for the wedding celebration. If you wish to have organ music at your wedding, you are urged to consult our parish music director. If you wish to have other musicians or soloists, please make arrangements with them and supply details to the parish secretary. Bride’s Room: Facilities for dressing at the church are limited. We request that brides and other members of the wedding party not dress on the premises. A small room at the rear of the church on the west side is available where the bridal party can gather before the ceremony. Scheduling: Weddings may be scheduled on Friday evenings (the times are negotiable) or on Saturday at 11:00 a.m. or 2:00 p.m. Those wishing to be married at 2:00 p.m. on Saturday should be aware that the ceremony and any picture taking must conclude by 4:00 p.m. when Confessions are heard in the church. Receiving lines should take place at the reception and not at the church. Altar Servers: Servers are usually needed for marriage ceremonies. If you have family members who can serve, please inform the parish secretary. Otherwise, servers can be provided by the parish. The recommended stipend for each server is $10.00. Rehearsal: Rehearsals are normally scheduled on a Thursdays prior to the wedding date. Another date and time can be arranged if there is no conflict with the parish schedule. The priest officiating must be present. Finalizing Details: Please call the parish secretary at least one month before the wedding to finalize details about arrangements in the church. * Flowers should not arrive more than one hour prior to the ceremony. * Fresh cut flowers only are permitted and should remain in the church after the ceremony. * Liturgical decorations suitable to the seasons of the Church year cannot be taken down or otherwise disturbed. * There are 22 pews, offering a seating capacity of just over 300 persons. * Runners are not permitted. * Unity Candles are not permitted. * No flower petals are to be strewn down the aisle, nor may rice, confetti, bird seed, etc. be thrown on church property. Photographs: During the ceremony, photographs may be taken as long as proper decorum is observed. Picture-taking on a limited basis is permitted after the ceremony and must conclude within one hour following the ceremony. This is especially true if another marriage ceremony or Confessions are scheduled to follow. The church and grounds are not available for photographs more than 30 minutes before the wedding ceremony. Please note: Alcoholic beverages or other refreshments are not allowed in the church, bride’s room, sacristy nor on the parking lot prior to or following the rehearsal or the ceremony. Smoking is not permitted anywhere on the parish campus. All of us at Our Lady of Lourdes Parish join in wishing you the happiest wedding. Whether simple or elaborate, your wedding should be a sacred occasion for you and your spouse. In the Catholic wedding ceremony, vows are exchanged between the spouses and God’s blessing is asked on their lives together. Your wedding celebrates the official beginning of your marriage. Marriage is an ongoing relationship between a man and woman that should support and encourage both spouses in the years ahead. Your preparations and attention to detail signal your full understanding of the significance of this occasion. If we can assist you in any way, please let us know.